Ask your local jaded economist how to get more or less of something, and they’ll give you a simple answer: change the price. If you want more, subsidize; if you want less, tax. Well, until yesterday, the Government of New Brunswick was casting a huge dollar-vote in favour of one of their favourite job-creating commodities: asphalt. Not the “making roads makes work” kind though (that’s a different story), but the kind that paves over the limited amount of land the province’s cities have at their disposal. Yes, we’re talking about boring, old surface parking. Every red block of parking you see is a space that could be something that actually improves the vibrancy and economic sustainability of the city. Where surface parking lots exist, we forgo the opportunity to fill that land with things we enjoy: people, parks, buildings, businesses, etc. And when you don’t even charge for it, you imply that it is practically worthless. In fact, our urban centres represent the most valuable and productive land in the region (economically, culturally, socially), so it’s important not to waste it. Consider instead if we took the total square footage of parking you see on that map, stacked it vertically in the form of paid parking garages distributed throughout the city, and gradually replaced those parking lots with amenities or buildings which could house people, businesses, and storefronts. Not only would you be generating a lot more tax revenue for the limited downtown space that you have, you’d start to approach a density of activity downtown that would keep the doors of local businesses open and the streets humming with life all year long. You’d also stem some of the demand for parking, because when we build great urban areas, walking and biking become so much more appealing and accessible. So in reality, you wouldn’t even need as much parking as we have today. This shift has to start somewhere, and the government should be congratulated for getting the ball rolling by example. Think about that. That isn’t the number of vehicles compared to the number of households. 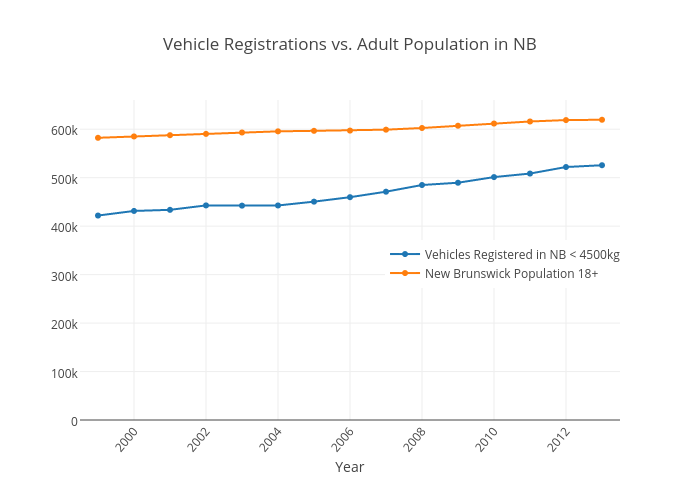 That’s the number of cars compared to the total adult population of the province. All in, the average cost of owning a mid-sized car for a year is about $10100. This means that the population of NB is spending about $5.3 Billion dollars per year just to get around day-to-day. That’s money that could be spent in much more effective and rewarding ways. Imagine if every household in New Brunswick had an extra $10000 to their name each year, and the opportunity to walk or bike on a daily basis. Which of our socioeconomic challenges would not be positively impacted by such a change? Finally, consider the positive impact this may have on the way the province’s cities are actually designed. Consider the last time you went for a casual walk when the weather was nice. Where did you go? Did you go for a nice stroll next to your local parking lot, or along a nearby 4-lane road? I can almost guarantee you didn’t. The human brain is wired to hate those environments. They’re noisy, dangerous and boring. Still, for some reason the province’s capital has three roads cutting directly through the economic heart of it that are classified as provincial highways. 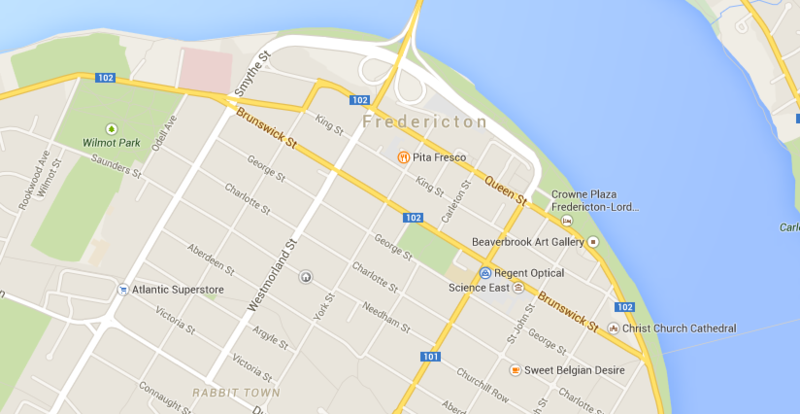 (Ever notice on Google Maps that Queen, Brunswick and Regent are coloured yellow? That’s why.) Some, like Regent St, are being prepped for expansion and high-speed throughput. Brunswick has already met that fate. Try reading just page 70 of this traffic engineer report to learn about how making Regent 4-lanes in downtown is supposedly ‘vital to the local economy and quality of life’. The plain fact is that you can’t design something you don’t truly understand or relate to. If what you relate to is being annoyed by not being able to park within a 15 second walk of wherever your destination is or being able to get home in 7 minutes instead of 9, I can guarantee you that you’ll know how to design a fine parking lot and high-speed road. If your daily experience involves avoiding cars in crosswalks, waiting for the next bus in -30 degree weather, or generally enjoying the public space provided by your city (that’s why you live there, right? ), you’ll start considering ways to improve each of those. And if you happen to be a civil servant that has the power to change how we build our cities, towns, and neighbourhoods, engaging directly in any of those activities will only improve your decision making. While a small step in that direction, phasing out free parking for all GNB employees is a great way to get that started.